kt literary » Blog Archive » Congratulations to SLASHER GIRLS & MONSTER BOYS! Congratulations to SLASHER GIRLS & MONSTER BOYS! 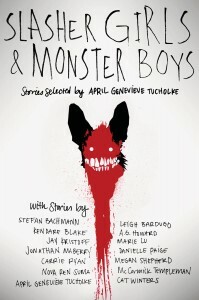 A huge round of congratulations to Stefan Bachmann and all the contributing authors in the SLASHER GIRLS & MONSTER BOYS anthology!! The Young Adult Library Services Association (YALSA) just named this book to the prestigious 2017 Popular Paperbacks for Young Adults list for Best Horror. Check out the entire 2017 Popular Paperback list here! ← Congratulations Locus Bestselling author Gerald Brandt!